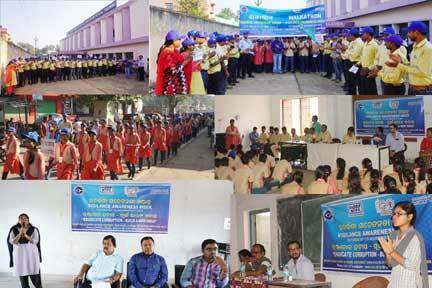 Kaniha: Vigilance Awareness Week is being observed at NTPC Talcher Kaniha from October 29 to November 3,2018 at NTPC Talcher Kaniha.This year, the vigilance awareness week theme is “Eradicate Corruption- Build a New India ”. A walkathon was organised at ITI Talcher. Around 700 students participated in the rally/walk during the morning hours. The big group of students along with faculties’ members took the citizen pledge to fight against corruption. Thereafter the group marched in the black diamond city with placards depicting messages on integrity and anti corruption. Elocution Competition on “fighting menace of corruption through use of technology” at ITI Talcher ,Talcher Autonomous College & Pabitra Mohan Institute of Technology,Talcher was held.Students took part in large numbers with enthusiasm which made the competition very special. Poster Competition for children was organised on theme of Vigilance Awareness Week at Recreation Centre of Power Station. Group Discussion among senior officials followed by elocution programme for HODs and sectional heads was organised at Vivekananda Hall in which participation of the senior employees was encouraging.